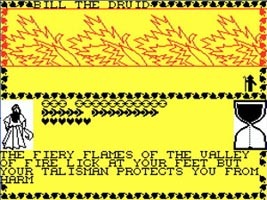 Back through the mists of time, well... in 1985, "Talisman - The Computer Game" was released onto the market to satisfy the cravings of those people who dreamed of playing the game in a whole new dimension. 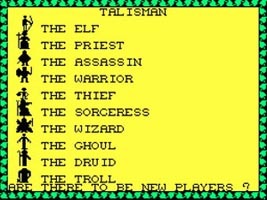 Claiming that it had "the first ever interactive multi-player arcade adventure", Games Workshop launched the Spectrum version of its fantasy game, Talisman. 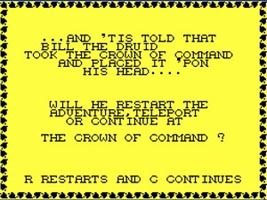 The program, which can involve up to four players in any one game, is a race to reach the 'Crown of Command' and control the destiny of the world. 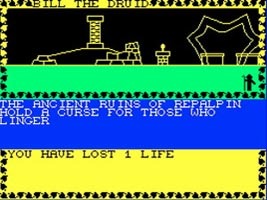 A horrific array of deadly creatures are out to stop you in your task, including those that are controlled by the computer and the other players. 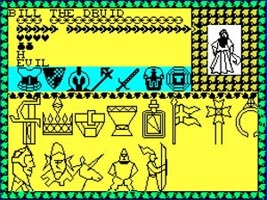 My current preferred method of playing the game is using the zx32 ZX Spectrum Emulator by Vaggelis Kapartzianis. You can check out his website at http://www.geocities.com/SiliconValley/Bay/9932. All of the files you will need to have a nostalgic digital journey are over in the Resources section under Downloads. If you would like a copy of the instruction leaflets that came with the game, they are also the in Resources section, under Rules. If you can't wait and simply must have a game right now, you can do so courtesy of Qaop, the Java Spectrum Emulator made available under the GNU GPL License. For more information about Qaop, you can visit the website - http://wizard.ae.krakow.pl/~jb/qaop/. Simply click on the game to focus the applet. Press Enter and then enter 1 - 4 for the number of Players. Use the arrow keys and then Backspace to select your Character. Enter your chosen name and press Enter or Backspace. The game will ask if you want it to be an Independent Character (computer controlled) or not. You must then choose a speed for play from either Laid Back, Moderate or Speedy (L, M or S). As play progresses you use Enter to encounter Spaces. TIP: If you are pretty quick on your feet you can actually run away from Enemies! 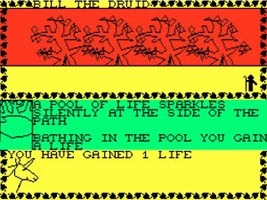 Refer to the instructions for more detailed information including Spells etc. If you don't fancy a go right now, presented below are some screenshots taken from the game so you can see what it is that you are missing out on!